Bak kwa lovers, this is your dream come true. 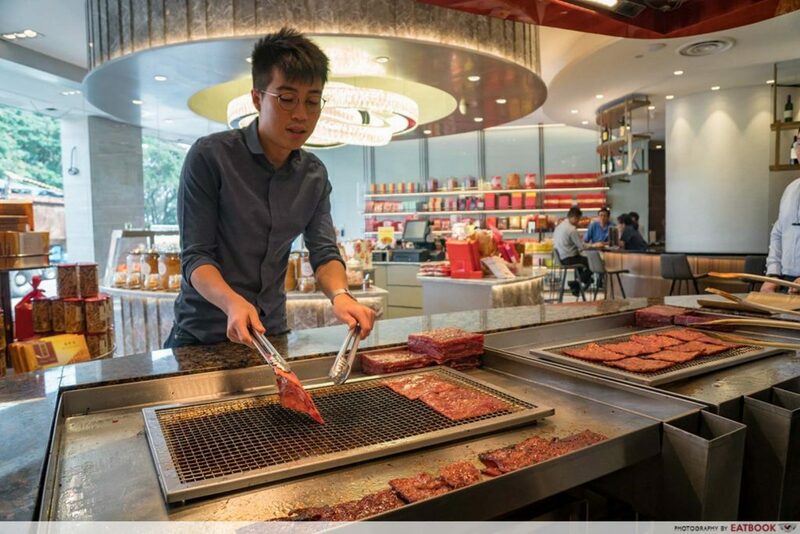 Bee Cheng Hiang just owned the bak kwa game in Singapore with their newly renovated flagship store. 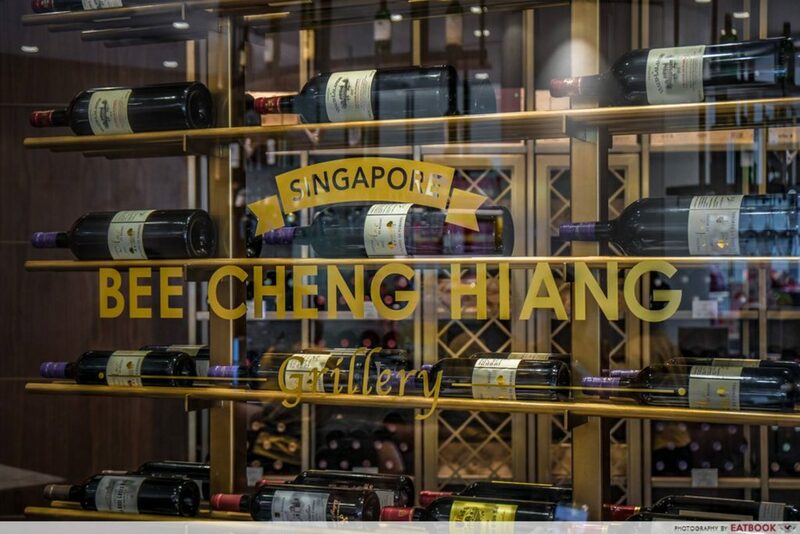 Now known as Bee Cheng Hiang Grillery, the spanking new space at Serangoon Road offers interactive activities and even a bistro with dine-in dishes and a wine menu. 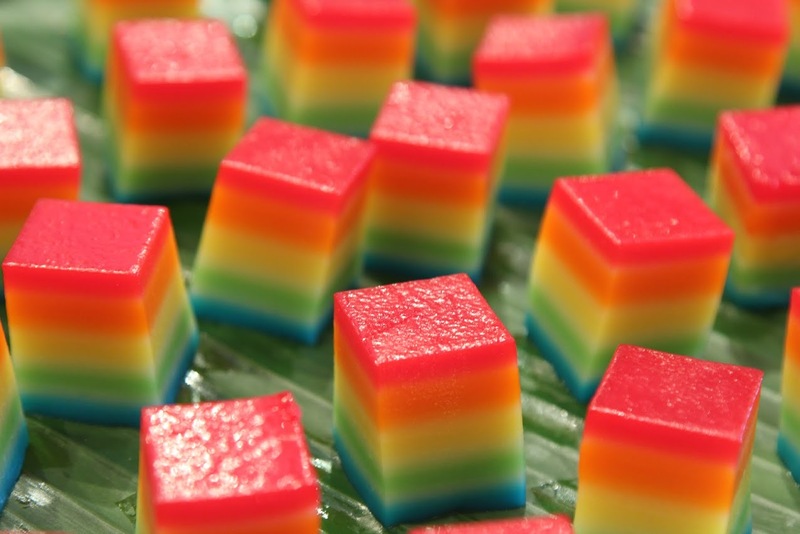 Here are some things at the new Bee Cheng Hiang Grillery to look out for. Bak kwa goes great with anything. Stir them in with porridge and you’ll turn a simple meal into an extravagant one. 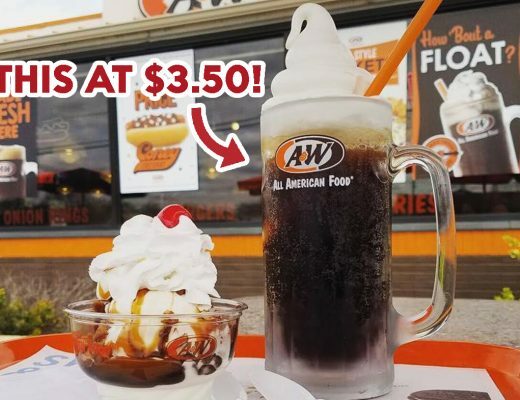 Put it on sliced bread and you’ll get a sandwich fit for a king. Pro tip: let the bak kwa sit for a while so that the charred taste gets soaked into the bread. 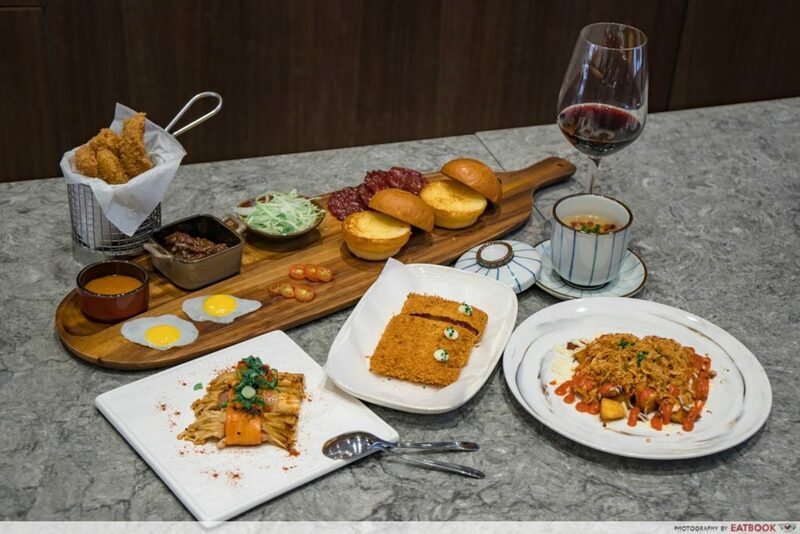 The menu is conceptualised by consultant Chef Zor Tan, the former executive chef of Restaurant Andre, who has come up with sharing plates centred around bak kwa and pork floss. There’s a strong focus on natural ingredients with most of the sauces and ingredients prepared from scratch. Drawing inspiration from Bee Cheng Hiang’s outlet in Tokyo, the Mozzarella Katsu ($10+) is a real eye-opener. Mozzarella is wrapped in bak kwa then coated with panko (bread crumbs). While this may sound easy to make, the devil is in the details, with the katsu having a thick and golden-brown crust that makes you feel as if you’re biting into an actual piece of tonkatsu. 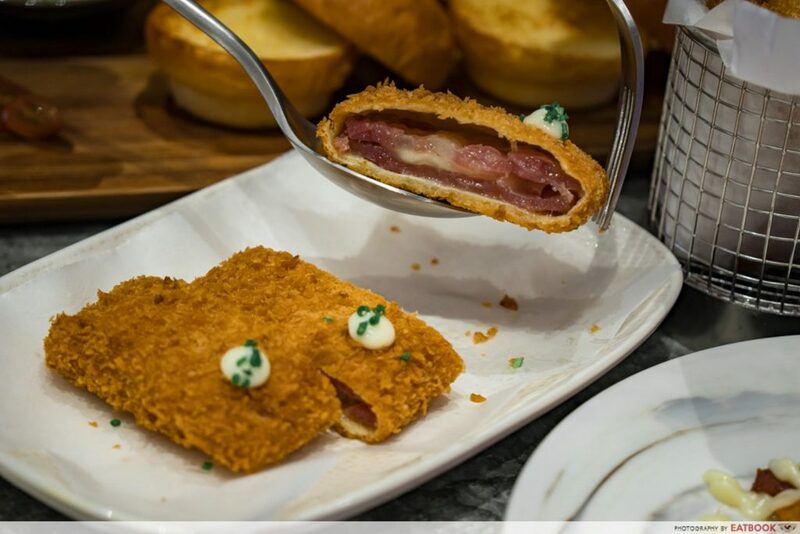 The sweetness of the bak kwa stood out again in this dish, blending nicely with the creamy housemade mayonnaise. 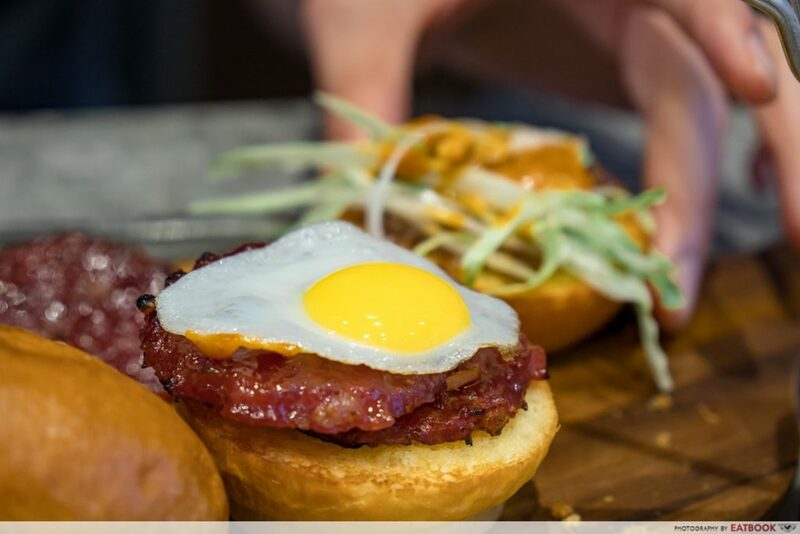 The DIY Sliders ($14+) is clearly an ode to humble sliced bread and bak kwa. 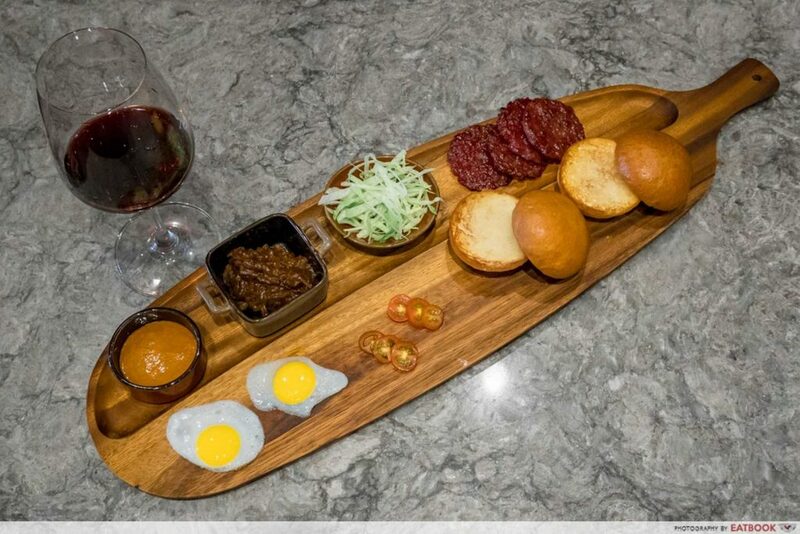 You get a platter comprising mini buns, caramelised onions, fried quail eggs, housemade sambal mayo and pork or chicken coin bak kwa slices. Combine the ingredients together and you’ll find that the flavours blend nicely, with the sweetness from bak kwa and onions mixing well with fiery sambal mayo. The mayo was the clear star of the show, winning us over with an intense shrimp flavour and an explosive kick. The bistro is currently undergoing a soft launch phase with just six items on the tapas-style menu, but stay tuned for the grand opening in December where there will be a total of 12 items. There’s also a BBQ station, stylishly named the barbecue theatre. 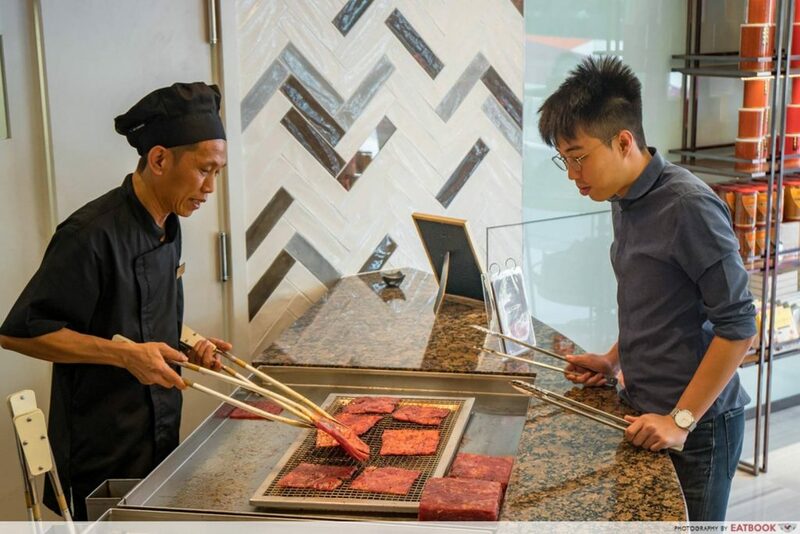 You get to watch staff members grill bak kwa over a charcoal BBQ pit for an intense smoky flavour. 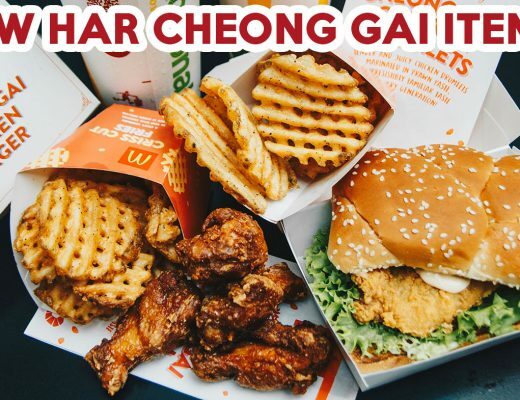 This is the only Bee Cheng Hiang outlet in Singapore that does this. 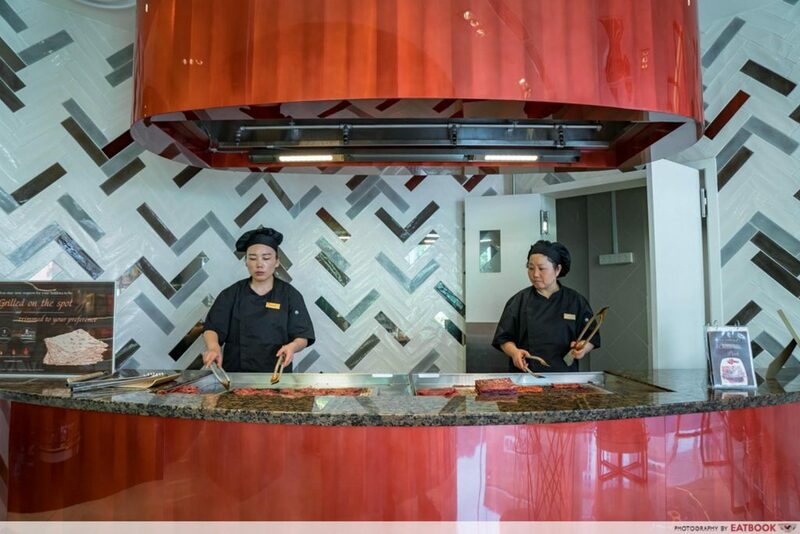 You can even grill your own bak kwa. For those who like their bak kwa a little more charred, feel free to leave it in the grill for a longer time. I left mine on the grill for a little too long and got more burnt bits than meat. 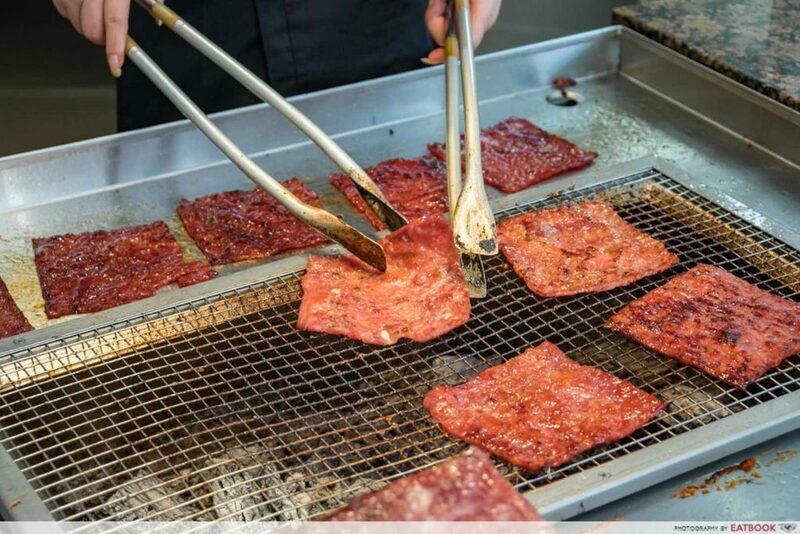 Grilling bak kwa is much harder than it looks, but you’ll get a quick crash course from the experts manning the grill. The bak kwa is sliced so thinly that you have to be really gentle with it. Yes, pairing bak kwa and wine is a thing. The store has a walk-in wine cellar that offers exclusive labels from Bordeaux. You can bring the wines home or have them at the bistro. 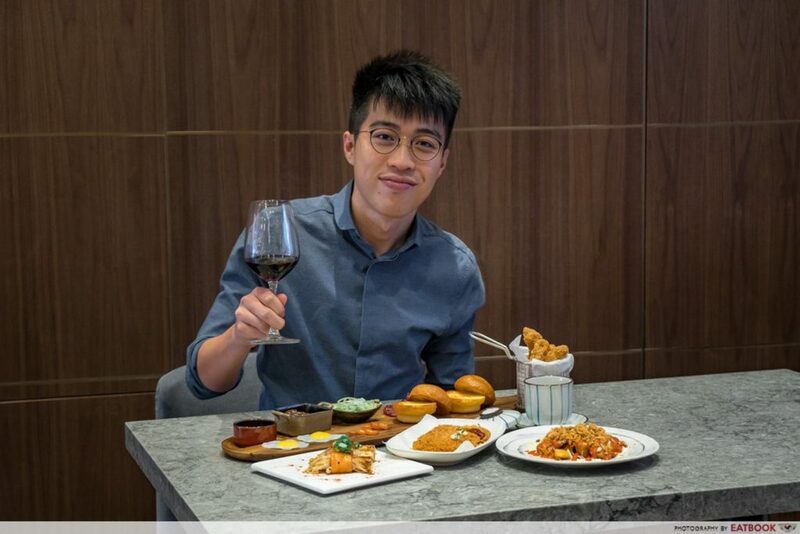 Each wine comes with a recommended bak kwa pairing, so you can channel that Crazy Rich Asians vibe while enjoying your favourite CNY snack. 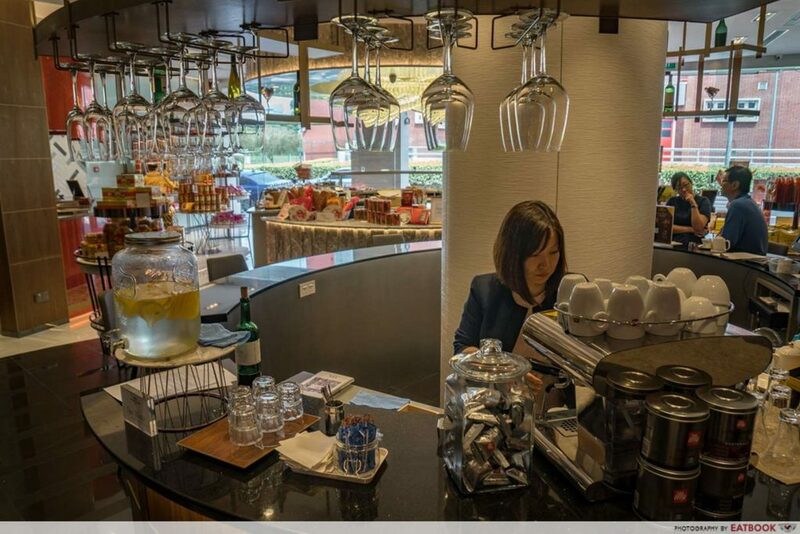 For those who are looking for just a glass of wine to go with their bak kwa, you can get their daily house pours at $14+ a glass. The round mouthfeel of the wines actually go surprisingly well with the smokiness and sweetness of the bak kwa. Bee Cheng Hiang Grillery has shown that enjoying bak kwa shouldn’t be restricted to just during Chinese New Year and special occasions. 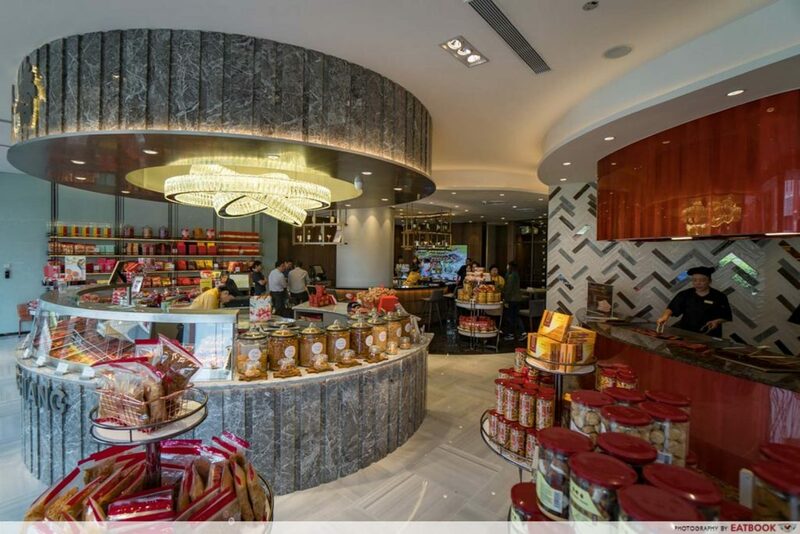 While the store has just six items on the menu now, the experiential and interactive spaces make it an interesting experience. Try grilling your own bak kwa and pair it together with a glass of red wine, and you might just get a pleasant surprise. 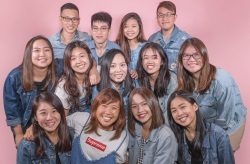 Photos taken by John Lim. This was a media tasting at Bee Cheng Hiang Grillery.